Most people know Impatiens wallerina. Nobody says the "wallerina" part though. EVERYONE just says "Impatiens". It's understood. In SoCal they are grown all over and in my opinion are the best annual plants for shade/partial sun color. They get almost covered in flowers and sometimes carry over through the winter depending on if we get a frost. I knew about Impatiens balsamina a long time ago. Some just say "Balsam". My late garden guru friend Alice grew it sometimes. You never see the plants in nurseries though. 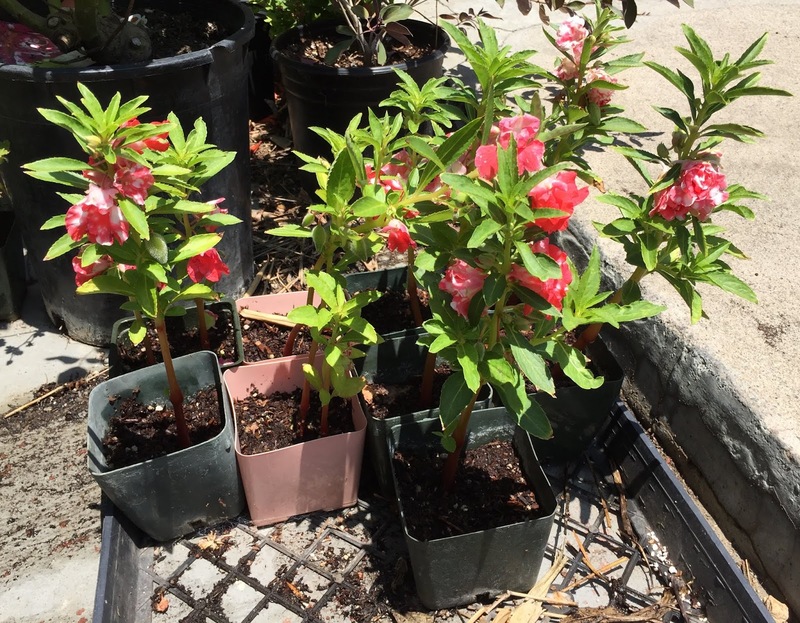 It is a taller, thicker Impatiens than Impatiens wallerina and can take full sun. The flowers are set inside the plant on the stem instead of on top like I. wallerina. It is native to southern Asia and is said to be used for many traditional health remedies. AND like regular Impatiens they have exploding seed pods! If you see one that's really fat, touch it and it will quickly and quietly open and fling the seeds far away from the plant. I love to show people that. It's fun! So, when I was ordering Zinnia seeds online from Baker Creek Seeds back in March, I also got some Balsam "Peppermint Sticks" seeds to grow for the first time. I am a sucker for stripes and splotches on flowers! 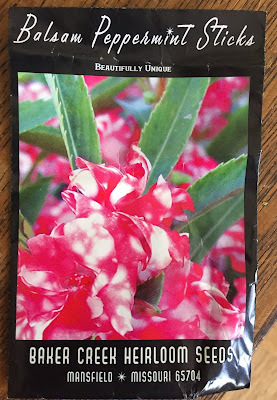 I love what it says on the back of the seed packet, "One of the grooviest balsam varieties in years, double scarlet flowers are splashed in white, very beautiful and unique looking". Got my seeds and planted them in 4" pots. I like to do that before setting them out in the garden. After about a month of sprouting and growth, I planted a bunch of them in the ground. Here is what they look like now. Yes, they are beautiful! Here are some growing with other plants. This is the stems of one of them. It must be about 2" thick! Reported to get 18" tall, my tallest one is already 30"in height! And of course growing from seed, I have more than I needed. I will probably sell these at the next Southern California Horticulture Society meeting on Thurs. July 12. Come if you're in the LA area. They're fun. We'll see what happens as they progress or if they make it through the winter. Do you grow Balsam? Not yet but I will try it! Will order seeds now! These are very beautiful looking plants! I don't think I have ever seen that species of plant before. Hope you have an amazing rest of your week. Keep up the posts!